It’s time to open your doors to fall (and maybe a little winter, eek)! Welcome the season in the most gorgeous way with a beautiful autumn or fall wreath hanging on the front door. You could even take some of these ideas and add a couple wreaths throughout the home to coordinate your whole look. And you can do this year-round, switching out your look for each spring, summer, fall or winter season. A wreath is a cheerful and versatile way to show off the season’s colors – all while making a great impression right from your doorstep. So what makes up a great fall inspired wreath? Is it the colorful flowers or the weave of vines? 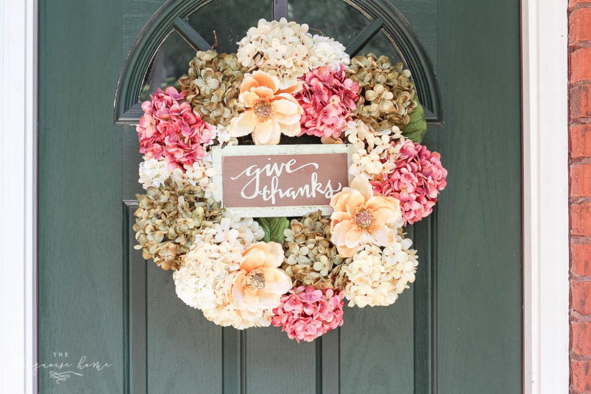 There are so many reasons to love these decorations, that’s why we’ve created a list of six of our favorite fall front door wreaths. Find your favorite below and share with us if you’ve made a wreath of your own for any season! Rustic decor is all the rage and I don’t think it’s a trend that’s going anywhere anytime soon. So I came across another fun DIY wreath project to try that is a rustic fall front door wreath. Just start by wrapping a foam wreath form with your favorite burlap. Then add twine or garland. Glue down some fall yarn and personalize a bit with some pineapple doilies or linen flowers and you have a unique DIY wreath that will stand out. You can find all of these pieces at your local craft store. For the full steps, check out Consumer Crafts. So, with that, fall is definitely a very rustic inspired season. There are an endless amount of options when it comes to creating your own wreath and you can really change it out as much as you’d like too. So which wreath are you thinking of hanging on your front door this fall? Let us know in the comments + maybe share a picture. We’d love to see them! Happy Fall and we hope you have fun decorating your front porch door for Thanksgiving, Friendsgiving and any other holiday or celebration you have coming up!